No charges have been filed, despite yellow tape identifying this site of a deadly poker game as a crime scene. 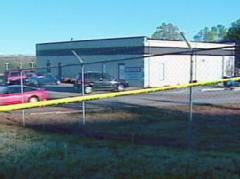 This time it was player-on-player violence … leaving one man dead and another injured after a gunfight broke out early morning at a warehouse poker game in Anderson County, SC. Jermaine LeCorey Scott, 34, supposedly was losing in the wee hours of a game last week, and at some point pulled a gun on five other players. Though not clear whether or not the triggering incident had anything to do with a bad beat or involved accusations of cheating, police contend Scott was attempting to rob his opponents … even though he was not wearing a mask like most (99 percent?) armed poker robbers. Players supposedly called flagged down police at a nearby intersection around 7 am on Tuesday to report the shooting, and deputies arrived to find two men shot, lying on the ground in the empty warehouse, which may or may not have been cleared of poker supplies before their arrival. Scott died at the hospital from multiple gunshot wounds a few hours later. The other player, unnamed, had bullet wounds to his hand and a concealed weapon permit. Police investigators have ruled the deadly shooting a matter of self-defense — justifiable homicide — and say they have no plans to press any charges.